What’s the fastest way to a woman’s heart? Through her nose. If you think going out of the house without a bath makes you a rugged hunk in women’s eyes, it’s time for a serious reality check. According to a study done by Cambridge zoologist Tim Clutton-Brock and Harvard researcher Katherine McAuliffe, the female of the species make use of their nasal compass to find their potential mate. That’s why picking the right scent obviously means a lot when it comes to leaving a lasting memory in a girl’s mind. 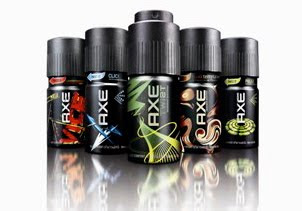 And Axe, a popular scent brand made for wannabe ladies’ men out there, gives you the chance to get noticed among the girls, with their range of olfactory teasers. Think you don’t have a shot at that girl the neighborhood jock is eyeing? Spray on some Axe Click and get ready to have her swoon with the watery freshness of cranberry-orange inspired by the Sea Breeze vodka cocktail. A bit of warning though: be ready to fend off wild swarms of women you might unwittingly attract along the way! Life’s a party and love’s your game, so get her grooving to your rhythm with Axe Pulse. With its playful, energetic citrus fragrance with floral spice scents that linger on, the night’s going to be one wild spree for you and your girl. Why make a move, when you can turn a shy girl into a vamp with a simple push of a spray button? Put on some Axe Vice and let its sensual fougère scent intertwined with naughty juicy fruity notes with a woody dry down make good girls unleash their darkest fantasies on you! Bring the ladies to a whole new level with your charm – with Axe Dimension. With its strong, masculine oriental citrus notes enveloped with aromatic herbs, girls will surely be swept away even before you show them your smooth moves! Girls like a good treat, and nothing spells pleasure than a bite of pure, melt-in-your-mouth chocolate. And with Axe Dark Temptation’s rich chocolate therapy heart combined with the sensually provocative oriental back notes of dark patchouli, vanilla and amber, these ladies will definitely start melting in your hands. So the next time one of the ladies comes your way, don’t wait for Cupid to strike her. Getting the ladies to notice you is as simple as spraying on your favorite Axe scent, now available at 75 pesos per canister. So grab a scent now – and win your girl’s heart instantly!